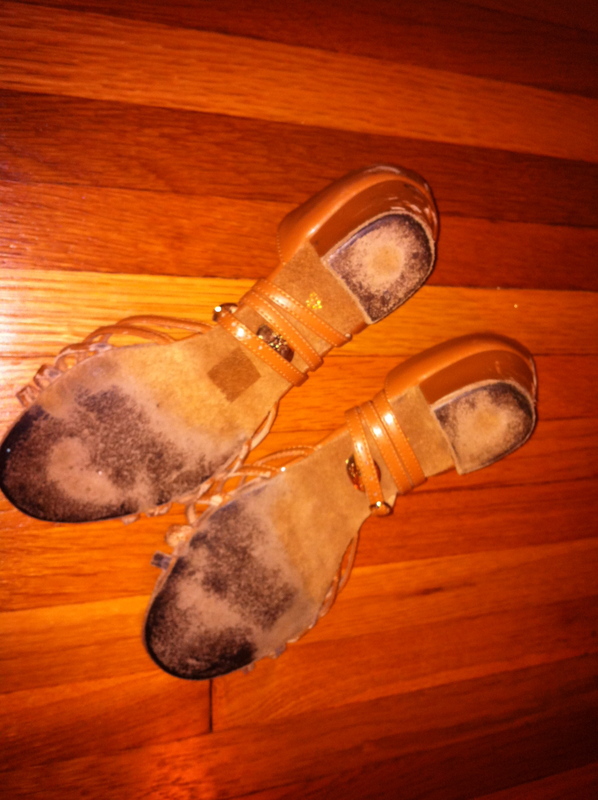 Dance Shoes – Just How Grimy Can They Safely Get? How grimy can the bottom of your dance shoes get before they’re no longer safe to dance in? Has anyone tested the limits of this? I’m talking about traditional ballroom shoes with suede soles. It doesn’t take long for them to get slick with dust and tracked-in muck , no matter how clean you think the dance floor is. I typically clean my shoes with a shoe brush at least once each practice or dance. Sometimes I clean them two or even three times when dancing on a tile floor (for some reason, tile seems to produce its own dirt, like Pigpen, even when diligently swept) or during the winter when people are apt to track in a sandy slurry from the parking lot. This is as clean as my shoes get these days. Some of the stuff around the edges has become permanent. It's the way of things. Recently, when I was commiserating with a fellow dancer about the state of the floor, I was shocked to hear him profess that he never cleans his shoes. Proudly, he propped his ankle on his knee and displayed his shoe soles, the suede completely occluded by shiny black grit. – “But isn’t that slippery? And dangerous?” I asked. This led me to wonder, later, how common is it for dancers to neglect their shoes soles? Can you get used to grimy, slippery soles and learn to compensate? Is there some advantage to the coating of particles? I’ve heard of dancers who use dance wax or talcum powder or even castor oil to treat their shoes when dancing on slick surfaces. In my experience, dance wax is a bad idea for suede soles. I hear castor oil can be a good solution when dancing on slippery hotel parquet floors. I’ve never tried talcum powder. In the spirit of experiment, I’ve decided to try neglecting my shoes soles for a short time. I am leaving my shoe brush at home to reduce temptation (I can borrow one in an emergency). I want to see how long it takes before I just can’t stand it anymore. So far I’m up to one dance and two or three short group classes. Oh, what we do, in the name of science ;-). Update: Went dancing this weekend. The soles are now at 3/4 occlusion. I was very surprised to find that this amount of gunk on the bottom did not have any appreciable effect on my dancing. Is it all in my head? My soles still have room to get worse, so I guess we’ll have to wait and see. Update: Have worn the shoes to a couple more dance classes. Still going strong. I cheated a little bit though. I did a few swivels on the studio carpet. I caught myself doing it and had to laugh. Cleaning my shoes on any available surface has become such a hard-wired habit. Wore them dirty to one more dance. They’re starting to get slippery. I’m not sure I can keep this up much longer. Wore my dance shoes to a Nordic folk dance this weekend. Afterward, the bottoms were coated with slippery, shiny black grime. I used a shoe brush on it, but I was tempted to try to crack it off with a chisel. Can’t do it…if I feel like my shoe bottoms are too slick, I have to brush them! Good luck with your experiment though!